Tapatio Salsa Picante Hot Sauce 10 oz. Tapatio Salsa Picante Hot Sauce 10 oz Tapatio hot sauce with chiles and spices. Tapatio Hot Sauce is finger licking good! This delicious condiment gets its name from its city of origin "Guadalajara" and is used to give a spicy kick of flavor to all sorts of tortilla based dishes such as quesadillas, enchiladas, tacos, huaraches and sopes, as well as soups, eggs, meats or poultry. Salsa de chile roja Tapatio con especias. La salsa de Tapatio es tan sabroso que te hara chuparte los dedos. Este delicioso condimento obtiene su nombre gracias a su cuidad de origen que es Guadalajara y es usado para darle un toque picoso de sabor a todo tipo de platillos basados en tortillas como tacos, quesadillas, enchiladas, huaraches y sopes, ademas de sopas, huevos, carnes y aves. I heard alot about this brand, Tapatio, so i had to try it. It is very good. no complaints. The best hot sauce around. The blend of spices just make this product outstanding. My husband who doesn't care for hot stuff even loves it!! The sauce isn't especially hot, but it has a nice rich flavor. 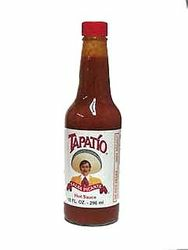 I've often said Tapatio should replace Tabasco as the de facto standard in the U.S.--similar heat, but, unlike Tabasco, not at all vinegary. A great hot sauce--in terms of heat and flavor--for lovers of Cholula. I tend to like my hot sauces hotter (El Yucateco), but I still find myself using Tapatio pretty frequently.